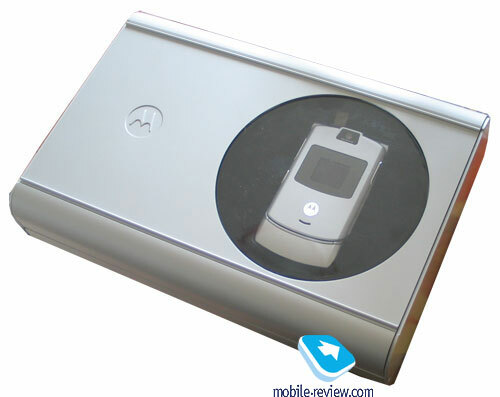 Motorola is one of several companies which has high sales in the clamshell segment. The models of this kind from this manufacturer appeared at the same time with Korean models or even earlier. 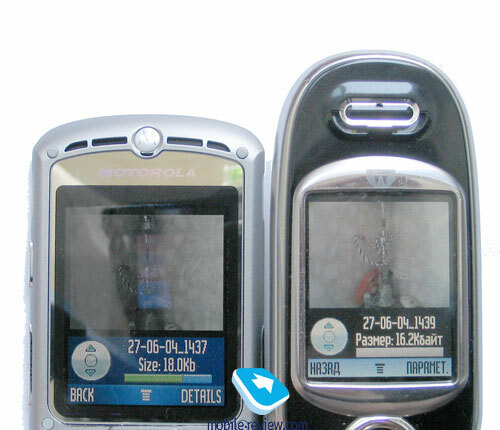 European users got acquainted with clamshells due to phones from Motorola. The company as a pioneer in this field had several popular products of this design, for example, everybody remembers the outstanding StarTac and further clamshells of V-series. All clamshell models were made at the same style typical for company: base functions and classical clamshell design. The market competition has become stronger and the company tries to find new niches for its products. 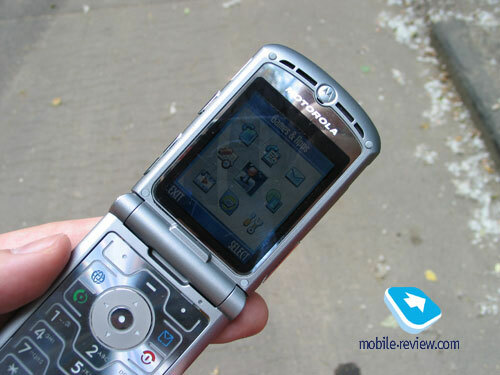 Not long ago it presented triplets (v300, v500, v600), than its versions made in other form-factors appeared (Motorola v80). Two years past since the company firstly announced its triplets, Motorola tested the new platform, tried to make it more reliable. Once the company succeeded, it became able to produce new products very quickly. New Motorola E398 and v80 are evidences of this fact. As you’ve guessed the new product of the company is based on the same platform as triplets and has a clamshell design. For the first time the company tries itself in the fashion segment of the high class, producing the phone which has the highest price for the mass product. 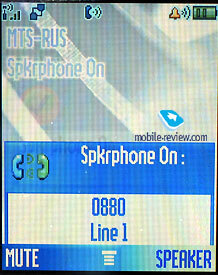 Of course, this phone is not a rival to the models from Vertu, because new Motorola is positioned in the mass segment. By the way, can we call the product that costs 650-700 USD a mass one? 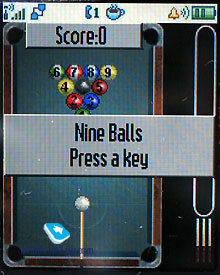 The example of Nokia 8910(i) sales shows that such kind of products can be successful on the market. What is the peculiarity of the new phone from Motorola? It’s very simple to answer. 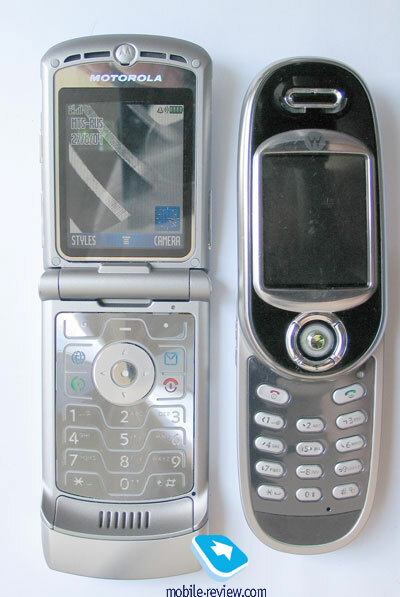 The developers had a task to create the thinnest clamshell phone on the market as soon as possible. 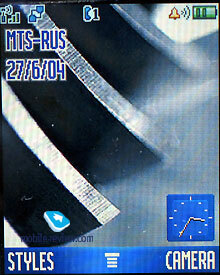 It was also necessary to use exclusive materials, mainly metal alloys. The project was named Razor, the core point of the phone is perfectly stressed by this name. 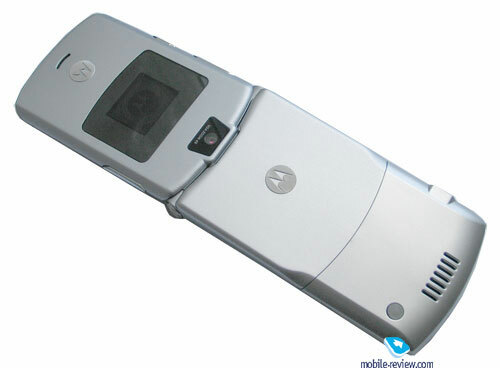 The full name of the phone is V3 Razor. Let us review it. At the first sight the phone can reminds a small PDA, it is rather wide but not high (comparable with current clamshells by this feature). When you take the phone you understand why it has its name, the phone is very thin (less than 14 mm). It is the depth of the closed clamshell, if you open it, the phone will be even thinner, especially the top part of it. If you touch the top edge of the phone, the edge will seem to be very sharp. One more time you will think that the name to the phone was not given occasionally. The unique feature of the phone is its material. The plastic is almost absent in the construction; different alloys are predominated. The material pleasantly cools the hand; it is not a common used sputtering, but the real alloy. The phone is made of metal and has the smallest dimensions, first of all the depth. 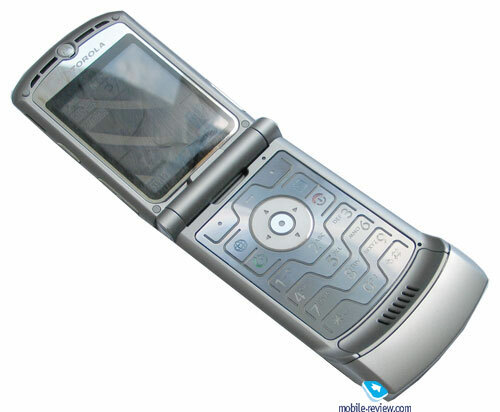 The main difficulty for developers was to make not the thin “metallic” phone. It was possible to solve this problem using space alloys differed by lightness and durability. The phone has good protection against falls. It is better than the plastic phones have, but it doesn’t mean that you can throw the phone, because the electronic part is rather fragile. 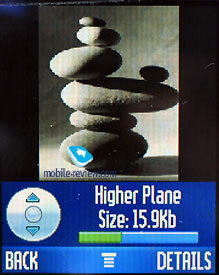 The weight of the phone is not more than 100 g. and it is also an achievement. We can compare the new product only with one mass model with a titanium body (sputtering) – Nokia 8910. This model doesn’t have unique dimensions but has a good opening mechanism that fits the phone of this class. 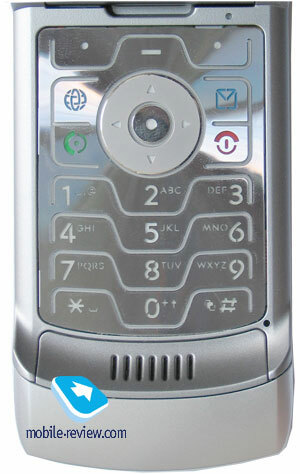 The model has a chrome keypad made of plastic to reduce the weight of the phone. 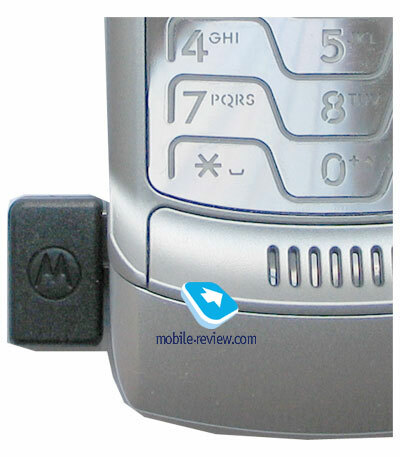 Motorola V3 has a keypad made of alloy, it is one third by height of the smallest keypad presented on the market. It was also one of the engineering questions, which designers had to solve. For the first time the whole keypad of the phone (soft keys and alphanumerical keys) is made as a touch panel, all keys are rather tight. One more alloy was used as a background for the keypad. The first impressions from the keypad are rather controversial, for the first time when you use it, you are waiting for certain keys movements, but do not feel them. The keys or better to say contact pads are large. 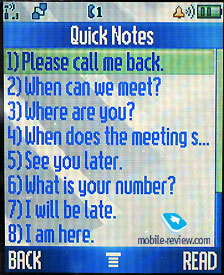 During several days you get used to the keypad and began quickly type SMS messages. The further practice tests showed that the keypad was convenient. The keys has a light-blue backlight (electroluminescent), it looks stylish. The backlight is not strong, we can say even pale but it is enough in most of cases. 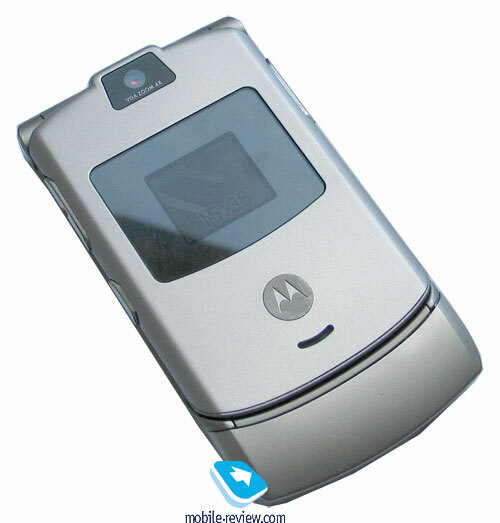 Let’s turn to the phone’s possibilities now; they are not strongly differed from those, which we saw in Motorola v600. The first difference is the external display, it is a color screen, which is capable to support up to 4096 colors, and its resolution is 98x64 pixels. 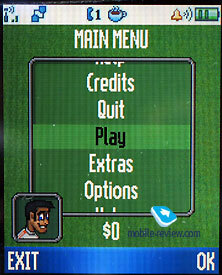 Up to 3 text lines can be contained on this screen, in reality this opportunity is not used. 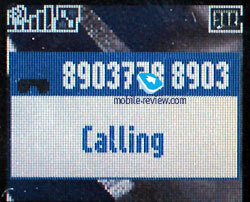 The external screen displays the information about incoming calls, events, helps to change profiles without opening the phone. 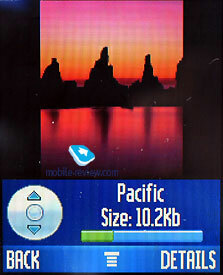 Unfortunately, the photo is not showed on this screen, the photo call function is available only for internal display. 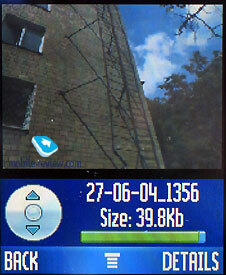 The phone is equipped with STN external display and the information is not visible in a sunny day. 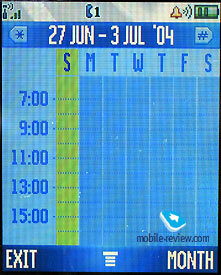 I think that this screen is just a fashionable feature; it doesn’t add any functionality to the phone. The internal screen of the phone was changed. 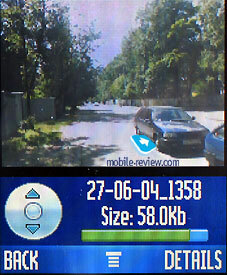 It was increased (by 2,2 inches), the new resolution became 240x320 pixels. Besides, now it is capable to support up to 262000 colors. Keep in mind that triplets are equipped with the 65K displays and these screens are one of the best ones today. 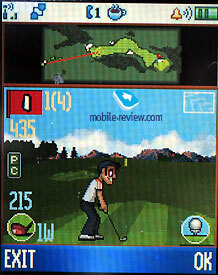 The screen in the new phone is slightly improved, although the quality of the picture can be comparable with the picture on the triplets, its size was increased. 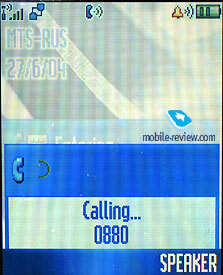 Thus, Motorola V3 has one of the best screens today. 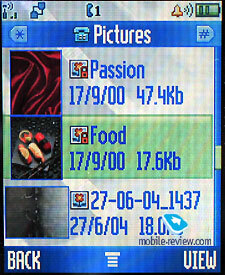 The number of text lines remains the same in the Motorola V3 but the fonts were enlarged. The same situation is with icons and other elements of interface. 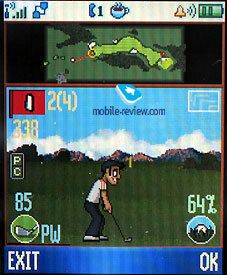 In the future, when the phone will use all physical settings of the screen, the interface might be redrawn. 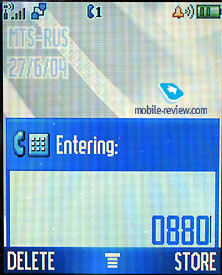 Control keys are located on the sides of the phone. There is a volume key and a key provided access to voice commands (the same key activates the recorder during the talk). Side keys demand efforts to be pressed and can’t be pressed by chance. The phone has a mini-USB connector, to which the charger is connected. 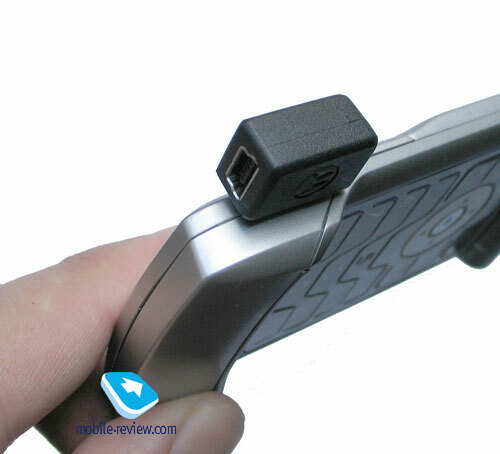 The standard kit includes a small adapter, which is set in this connector. You can see a speaker on the back cover of the phone, speakers are also visible in the open phone mode. In my opinion, the volume of the phone was greatly increased (24-tones polyphony). The phone can be heard on the street that is very pleasant. All melodies are nice. You can download your own mp-3 melody (not the maximum bit rate, read the instruction). The back panel covers the battery compartment. You need get used to setup it; otherwise, there will be a backlash between the battery and the back cover. 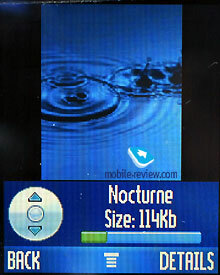 The phone is equipped with a Lit-Ion battery of 750 mAh capacity. According to the manufacturer the phone provides up to 200 hours in the standby mode and up to 3 hours in the talk mode. The field tests showed that the phoneу works a little bit more than 2 days in case of using the phone about 1 hour per day in the talk mode (MTS network) and up to 25 minutes of using other functions (mainly bluetooth). The time of full charging is less than 2 hours. 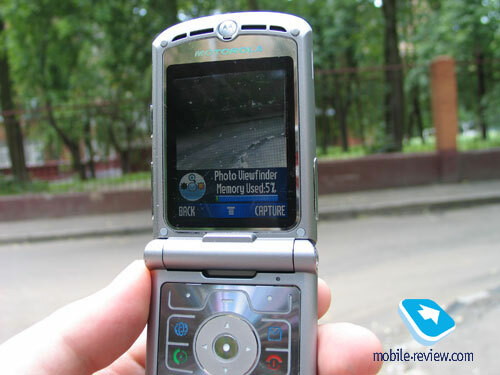 There are not so many software differences from Motorola v600. All of them will be described below. But firstly, read the review of triplets, where all functions are described in details. The first difference is a built-in kit of Java applications. The phone has a 3D phonebook. You can input up to 9 phone numbers in it. 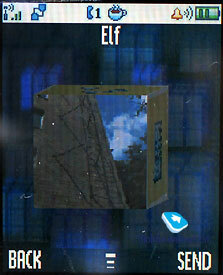 The photo is assigned to each of them; and shown on the one side of the cube by default. 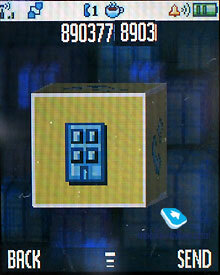 Then, you choose that cube you need and rotate it with a help of the navi key. 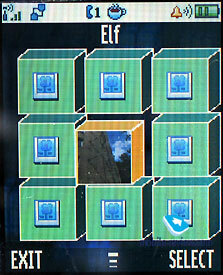 Each side of the cube is assigned with its own number, for example, if rotate it to the left, you can see an office phone. The conception is very interesting. This book is synchronized with the general phonebook, and check all notes while loading. 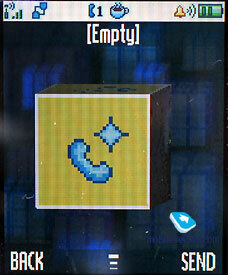 Thus the main disadvantage of the 3D phonebook is that you can’t load it quickly. In this model it remains just an interesting toy. Some more words about games. 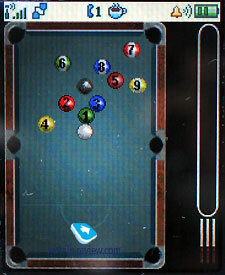 There is a nice billiard in the phone. 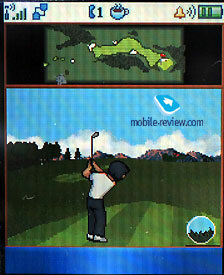 It is pleasant to play it because of the large dimensions of the screen. The same is with golf. 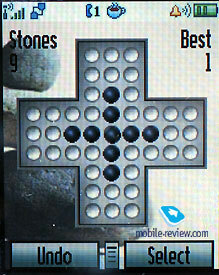 The third game – “Stones” is the same as in the other models. 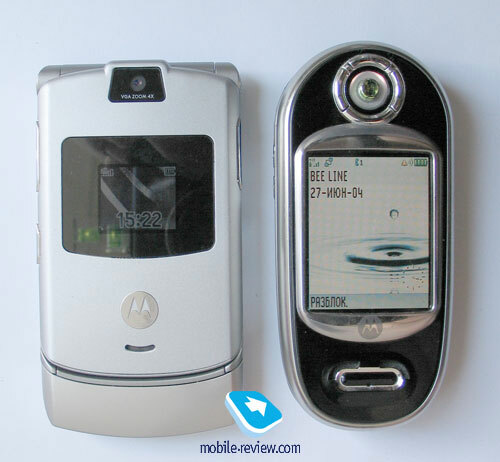 That is all about the differences from Motorola v600. 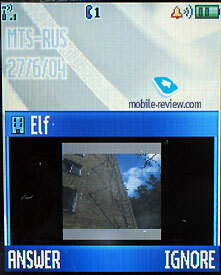 Once again I offer you to know more about the functions of the phone from this review. 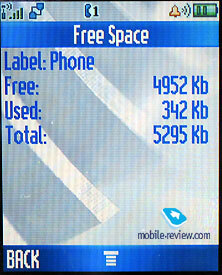 The phone’s memory is 5.5 Mb. The new product has the same memory capacity. 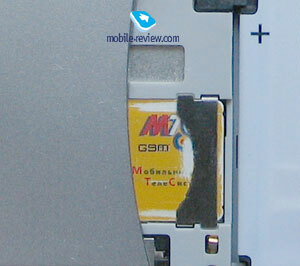 The Motorola V3 doesn’t have expansion slots for memory cards either. 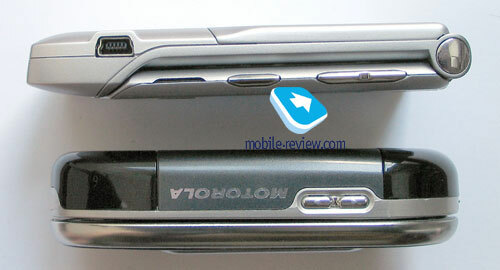 The connection quality of the Motorola V3 Razor is the same as triplets (v500, v600) have. The ring volume is high, vibracall is rather weak (somebody, vice a versa, say that they feel it better). 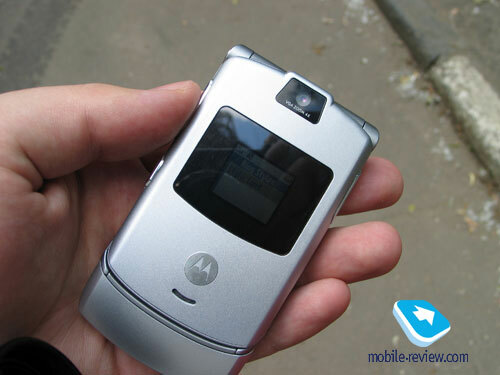 If compare the new phone with Motorola v600, it has the following advantages: internal antenna, large internal screen, improved ring volume, and at last materials, used while creating the phone. V3 Razor is a fashion phone, it was made to emphasis the social status of the owner. The beginning of sales is expected to be in September, the price will be between 650 and 750 USD. Today there are no similar phones by features (unique functions and used materials) in this segment. The manufacturer is not going to reduce the price greatly, may be it will cost about 500 USD in the end of live cycle, not less. The practices shows that the stability of the price attracts the users of these phones. Summing up, we can say the following: the model is very convenient in every day usage. It is flat and you can wear it everywhere you want. The phone always attracted attention, though some people didn’t even recognize a phone in this device. Motorola succeed in producing a nice phone of the fashion class which will become popular very soon (I am sure that it will be in Russia). For those who need functions in the phone I recommend to wait for update version of triplets (v300, v500, v600).